The management of an endowment has become bifurcated and complex. There is, more often than not, a division between two cultures serving one goal: investments and operations. The core, as it should be of any fiduciary, is its investment team. All others are often compartmentalized into a secondary or tertiary position, making day-to-day management and long-term planning more complicated. Add to these factors the increasing complexity of investments – alternatives, numerous managers, ESG, SRI, and the demand for additional transparency and communications from a variety of constituents – all present time-consuming challenges for CIOs and senior managers. Operations are necessary for the precise reporting and organization required by all fiduciaries. This is the sole focus and business of Xofficio. Our team thrives on details and consistency. Many investment professionals are unaware that outsourcing day-to-day, detail-oriented operational duties can increase accuracy, efficiency, and also realize gains in focus and time management. Xofficio enables greater focus on investments and other critical duties. At Xofficio, we master operations, create processes, optimize technology, and execute detailed tactics on a custom basis to meet fiduciary requirements. Our process-oriented strategy embraces enabling and optimizing technology, custom designed to improve your accuracy, reporting, and turnaround. With a forward-thinking perspective and deep industry knowledge, you can expect processes and solutions that are outcome-focused. We are well versed in industry, custodian, and administrator software, knowing exactly how they integrate and how they don’t. We value consistency in process with more than one set of eyes on all data sets. With Xofficio, you gain the confidence you need that things will get done – with precision and on schedule. Consistency, accuracy, and dedication are the three pillars that form our foundation. We deliver work that is accurate, streamlined, and of the highest quality. It is often more effective for the overall organization to outsource operational tasks to professionals than to “work it through” internally. All of our work is performed with an extremely close attention to detail and an eye on accuracy. Our team engages in regular communications – electronic, email, and calls – to discuss exceptions and “unexpected” issues that, frankly, are expected with the sophistication of today’s demanding investment environment. Our clients count on our dedication and institutional knowledge to handle their specific operations. We embrace and thrive on this responsibility. We have written an informative guide about the benefits of outsourcing day-to-day operations. This guide includes 10 reasons to outsource. 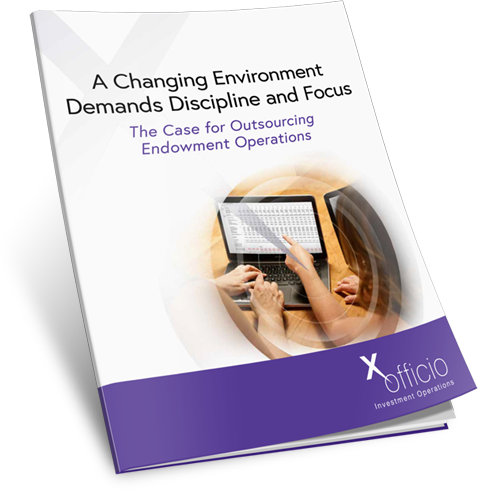 Explore how outsourcing can enhance your overall organization by taking advantage of Xofficio’s experience.